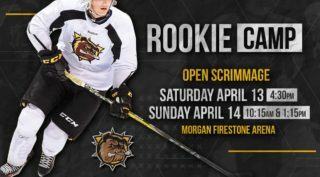 The Hamilton Bulldogs finished off the weekend Sunday afternoon with a 3-2 home ice win over the Sudbury Wolves. 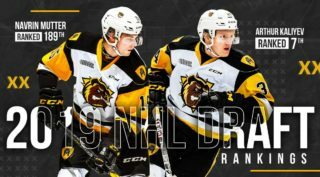 The Bulldogs had the better of the chances early but came away empty handed until Matthew Strome (24) jumped on a juicy rebound at 17:26 to make it 1-0 after the 1st period. 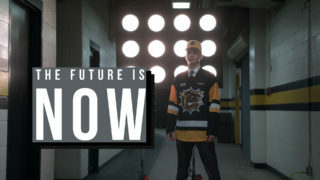 Hamilton jumped out to a 2-0 lead at the 39-second mark of the 2nd period as Nick Caamano (19) took advantage of a Sudbury giveaway, but the visiting Wolves, out-shot 21-9 in the period, scored two goals just under three minutes a part to send the game into the 3rd tied 2-2. The Black and Gold kept the pressure on and despite being frustrated by the play of Sudbury goalie Mario Culina, Brandon Saigeon (22) shoveled home the game winner at 6:12 to make the final 3-2. The Bulldogs out-shot the Wolves 49-25. Sudbury goal scorers were David Levin (7) and Dimitry Sokolov (20). 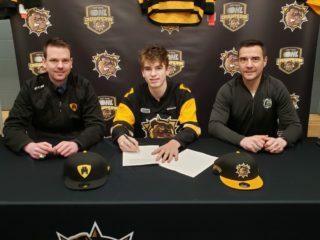 – Bulldogs defenseman Kade Landry played in his 100th OHL game. – Nick Caamano extended his point streak to 12 straight games (6-10 = 16pts) while Ryan Moore’s assist streak is up to 10 straight (2-11 = 13pts). – With the win, Hamilton’s season record is now 25-9-3-3.